For once, I’m feeling really refreshed after the weekend. I tidied up my place yesterday morning and abandoned my to-do list for the afternoon, choosing instead to camp out on my bed with a book. Necessary! Later on, my friend and I rode our bicycles to a bar to watch the Oklahoma City Thunder game, because suddenly I care about basketball. I’m not quite sure why—maybe it’s because we’re in the playoffs, or because our players are cute, or because I’m turning into my mother. Please don’t say it’s the latter (sorry, Mom). Anyway, this strawberry panini is killer and I’d like for you to make it pronto, please. The word sandwich falls short as a descriptor; this is a panini, or more accurately a singular panino, regardless of the lack of grill marks. 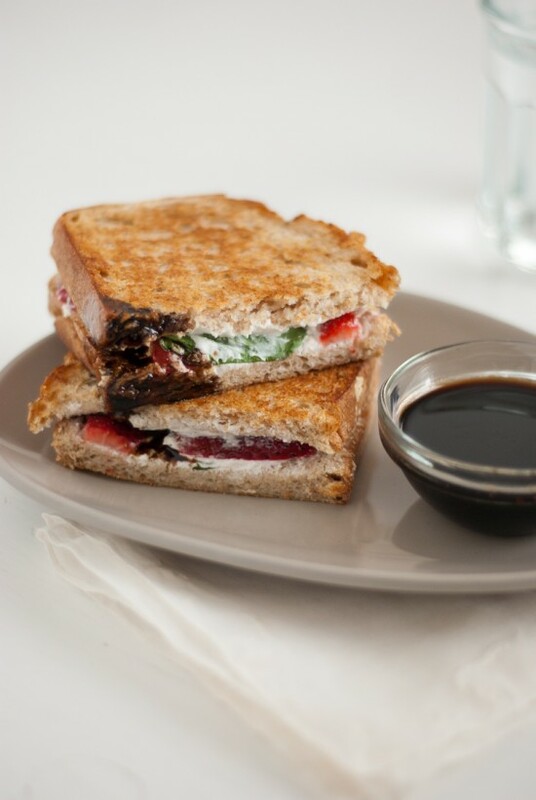 This panino consists of warm, jammy strawberries, tangy goat cheese and fresh basil sandwiched between golden brown, buttery whole wheat levain, served with a side of balsamic honey dipping sauce. You want to make it right now, right? I’m thankful that Margarita chose the chocolate and cherry panini for this week’s Food Matters Project recipe, because now I know how to make panini sandwiches at home without one of those newfangled panini cookers or grill pans. Basically, it’s as simple as making a grilled cheese and squishing it with something heavy (find more detailed instructions in the recipe below). I knew I wanted to attempt a savory take on the chocolate and cherry panini recipe, so I first tried a goat cheese and cherry filling, but it wasn’t quite right. As much as I enjoy fresh cherries, they seem to be cloyingly sweet when cooked. Later, I spied the strawberries next to the basil in my fridge and this panini was born. It is, if I say so myself, perfect, especially with the addition of balsamic honey sauce. The balsamic honey sauce is a super simple recipe from Alice Medrich’s new dessert cookbook, Sinfully Easy Delicious Desserts. I was walking out the door when I found this cookbook wrapped up on my doorstep, so of course I had to pause to flip through it. Then, entranced by the ingenious simplicity of the recipes and the unexpectedly stunning photographs by Sang An, I had to sit down and admire the pages more carefully. The balsamic honey sauce is only my first recipe to try from the book and it’s so simple it barely counts as a recipe, but I assure you there will be many more. Alice Medrich is known for producing foolproof, well-tested recipes, and this book is brilliant and inspiring. You should probably get a copy so we can obsess over it together. 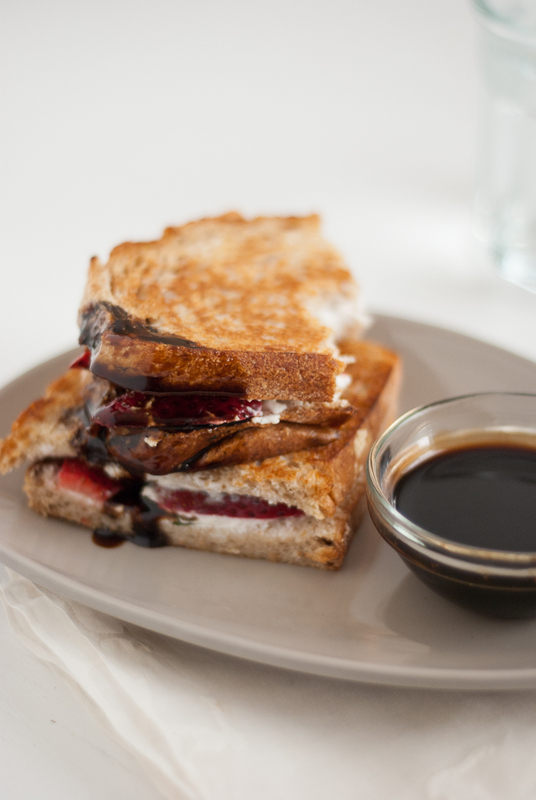 A simple grilled sandwich with gourmet flavor, served with a side of balsamic honey sauce. No panini press required! Spread a layer of goat cheese over both slices of bread. Slice your strawberries relatively thinly by cutting off slices from the outside of the strawberries, leaving the center behind. 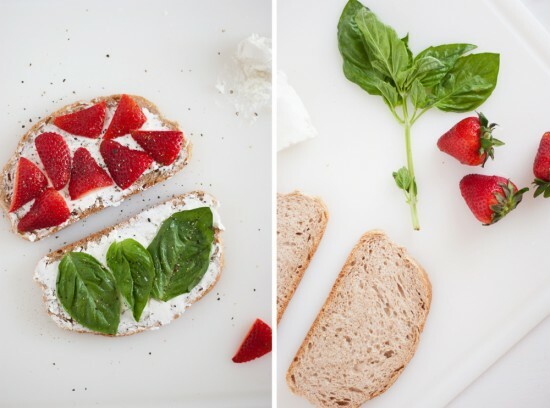 Spread strawberries over one slice of bread, and basil on the other. Sprinkle both sides with black pepper, and lay the basil slice face down on top of the strawberry slice. Heat a small to medium skillet (cast iron is best) over medium heat. Melt one to two teaspoons of butter in the skillet, then add the sandwich. Cover it with a plate or appropriately sized dish and weigh it down with something heavy, like canned beans or a cast iron skillet. Cook until the bottom of the bread is lightly browned, about two to three minutes, then lift the sandwich from the pan, add another pat of butter, let it melt, and return the sandwich to repeat on the other side. Slice each sandwich in half and serve warm. To make the balsamic honey sauce, combine the balsamic vinegar and honey in a small saucepan over medium-low heat. Simmer, stirring constantly, until the liquid is reduced by about half (15 minutes or more). Pour the liquid into a small bowl to cool. Panini adapted from The Food Matters Cookbook by Mark Bittman. Balsamic honey sauce from Sinfully Easy Delicious Desserts by Alice Medrich. I recommend making the balsamic honey sauce first. 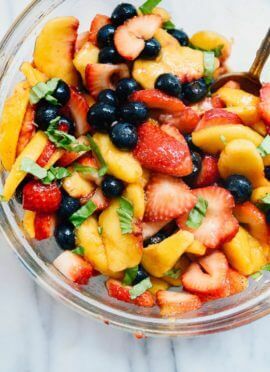 Save leftovers for drizzling over Greek yogurt, vanilla ice cream, pizza, peaches and berries. If you’d like to make multiple sandwiches at once, you might try Bittman’s other cooking method: preheat the oven to 400 degrees Fahrenheit and butter your slices of bread on one side. Place the bread, butter side down, on a baking sheet and spread the topsides with goat cheese. Add fillings as directed below, and top with another slice of bread, spread with goat cheese on the underside and butter on the topside. Cover the sandwiches with another baking sheet and weigh the sheet down with something heavy, like a cast-iron skillet or canned goods, and let it sit for 5 minutes. Remove the weight and the top baking sheet and bake the sandwiches until the bottom of the bread is lightly browned, about 5 minutes, and then repeat on the other side. 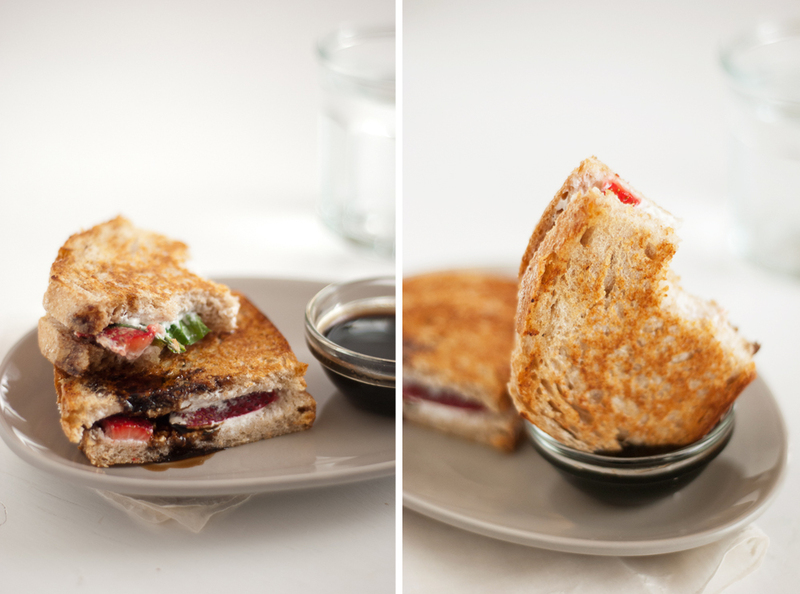 The panini fillings would make for delicious whole wheat quesadillas or crostini as well. For more panini inspiration, check out the comments section at The Food Matters Project. YUM! I love your savory take on this week’s recipe and your dipping sauce looks divine! 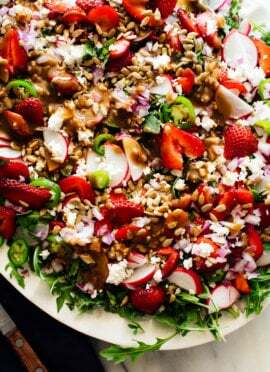 I think I’ll take your advice and find a way to make this for lunch today! Mmmmm, this looks absolutely amazing. Can’t wait to try it! Anything with goat’s cheese and strawberries is a winner with me. That balsamic honey sauce sounds amazing; in fact, the whole sandwich sounds amazing! I love the freshness of using strawberries in more savoury dishes especially when there’s basil involved too! oh lovely! i enjoy the combination of strawberries + basil. i don’t have a panini press either, so i created the grill marks with a creme brulee torch. It is funny! I was thinking I should tweet you about the game last night. This reminds me of goat cheese and strawberry bruschetta that my mom used to make for me! That balsamic dipping sauce really seals the deal. Can’t wait to try this one! Such a great idea for a warm weather lunch! On especially hot days I usually just make a salad but this seems almost as easy. oh fam you need a bandaid ? Hummm !!! Great idea ! Oh, gosh. My bf is a HUGE fan of the OKC Thunder (and “huge fan” doesn’t even accurately describe it). These past few games have been stressful! Maybe I’ll make this sandwich to calm his nerves a bit. Thanks! Mmm I am making something very similar tonight for dinner but with apricot and ricotta… I love the basil idea and may use that! I love your version and that sauce …. Definitely making that here! I love everything about this, over and over again. Great flavors!! Most genius sandwich idea EVER!! Taking the weekend off is always a YES, especially if it involves a good book. Speaking of…any recommendations? Also, this panini certainly does look killer. Strawberries with basil and balsamic is my idea of heaven. Love this! Mmm can’t wait to try this out. Looks super fabulous! I love afternoons spent with a good book…and the combination of strawberries/basil in the summer. This panini looks amazing! This sounds great Kate! Oh…unbelievable basketball this series! As always, Kathryn, your recipe is to die for. Nice work! Oh my gosh, yum! This panini looks amazing, and better yet, there’s a delicious balsamic sauce to go with it. I think I could probably drink that balsamic honey sauce! It sounds so good! Yum! Very easy and vibrant panino! Love it. wow the flavor combinations you have here are exquisite! 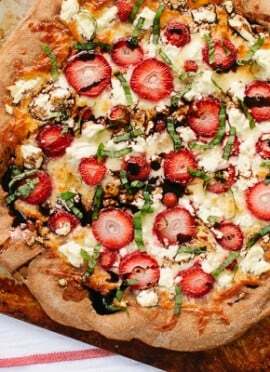 The little tang of goat cheese and the sweet strawberries in basil together sounds amazing! These look absolutely AMAZING! Love it. Mouth-watering photography too! Wow, I just found your blog and I absolutely love it! Amazing photographs, and the recipes look equally as awesome. I love this sandwich too–thanks so much for sharing! I chanting ‘want want want’ in my head. That’s the only thing I can think about looking at this panini. I LOVE this recipe!!! I ended up adding some lightly sautéed vidalia onions and it was perfect! Even my husband loved it…and trust me, that is saying a lot! I am also making an uncooked version for lunch at work tomorrow. I plan to just drizzle a little leftover balsamic honey glaze inside the sandwich. I know it will be great though! That’s terrific, Samantha! So glad you and your husband enjoyed the panini. Vidalia onions sound like a great addition! Wow, this looks amazing! I love all elements of this idea, but would have never have thought to combine them! Delicious! i have been reading your blog for a while now and i finally am getting around to saying your pictures are awesome, your recipes are inspiring, and your pup is adorable. this recipe looks especially delicious and i dont think i am going to make it one day without trying it myself! Just finished eating this and I think I’m in love! Next time (which will be soon) I think I’ll chop the basil. I found myself pulling it out with each bite and ran out before I ran out of sandwich. And that sauce… I want it with every meal. So glad you enjoy the sandwich, Alicia! I think I’ll chop the basil next time, too. Maybe a sandwich version? Such a great idea! Love this. A good variation is pumpernickel with laughing cow creamy swiss light. My sister and I just made these after stumbling upon your blog earlier today. Best. Decision. Ever. I’m already addicted and will be trying out a few more recipes within the week! Thank you for this awesome recipe! I’m so glad I found your blog, and really, really appreciate your blogging and photography tips, as I’m starting a blog as well and welcome the help. You’re welcome, Amani. I’m so glad you appreciate the blogging tips. Best of luck with your blog! I made these sandwiches for lunch yesterday and they were so delicious! Thanks for sharing your recipe, I will be making this one again! Thank you, Tami! I’m glad you enjoyed the panini. My family loves this recipe. Thanks!